Indonesia is facing its biggest environmental disaster in the past 10 years with the oil spill polluting the Balikpapan Bay in East Kalimantan, affecting the marine ecosystem as well as coastal residents. Here’s what we know and what we don’t about the incident. On March 31, a burst pipeline – which is used to transfer crude oil from the Law-Lawe Terminal in North Penajam Paser regency to an oil refinery facility in Balikpapan – caused the oil spill that polluted Balikpapan Bay. The spill also led to a fire that broke out at noon on March 31 near Panama-flagged coal cargo vessel MV Ever Judger 2, which was docked in the bay. The 20-year-old pipeline belongs to state-owned oil and gas firm Pertamina. It is 22 to 26 meters under the sea, is made of steel and has a diameter of 20 inches. The authorities claimed the pipe had moved 120 meters from its original location. The spill covered a 400-meter area of the bay at first, but then spread to a radius of over 2 kilometers in the waters around Semayang Port to Margasari. 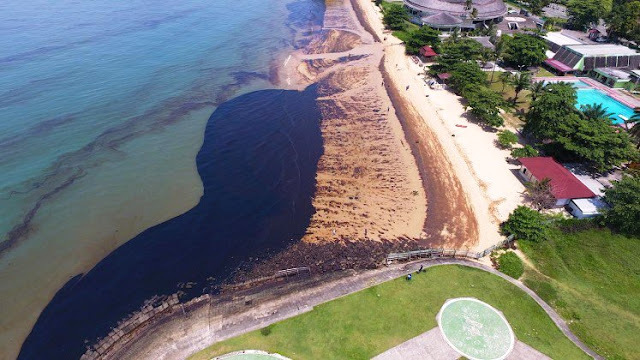 Satellite images from the National Institute of Aeronautics and Space (Lapan) on April 2 showed that the oil spill had covered 12,987 hectares of Balikpapan Bay, as the oil was spread out by waves and currents. On April 6, the Maritime Affairs and Fisheries Ministry claimed that the area affected by the spill had widened to 20,000 ha based on satellite images. A day later, however, the Environment and Forestry Ministry disputed the number, saying that the spill had only widened from 12,987 ha to 13,559 ha. Both the spill and the fire had caused casualties as well as environmental damage. The fire that broke out soon after the spill was discovered on March 31 caused the death of five fishermen who were caught in the fire. The victims were Sutoyo, 52, Suyono, 45, Imam Nurokhim, 41, Agus Salim, 42 and Wahyu, 27. Apart from the fishermen, the fire also injured a crew member of the vessel MV Ever Judger 2, which was docked in the bay. The vessel’s 20 other crew members were evacuated safely from the bay. Residents living around the affected coastal area suffered from nausea, vomiting and suffocation from the strong smell. It also drove residents to stop cooking, fearing that the fuel-filled air would burst into flames as they turned on their stoves. The spill also affected marine animals and plants, as activists and officials discovered dead crabs and an Irrawaddy dolphin on the coast. Balikpapan is known as the home of endangered Irrawaddy dolphins. 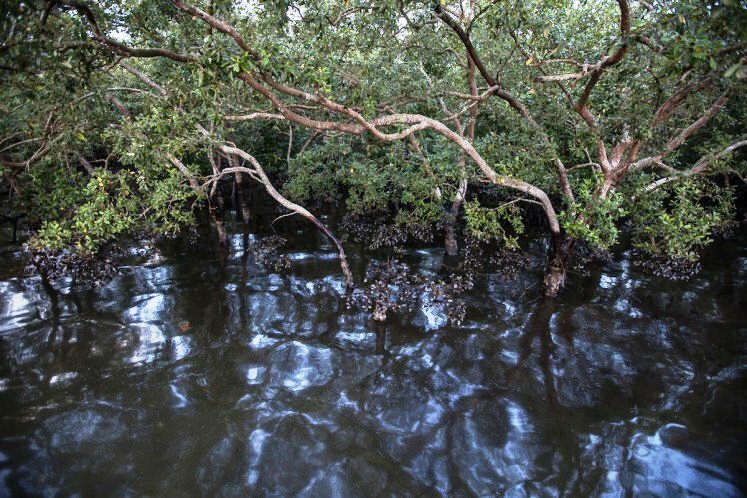 The spill also affected around 34 ha of mangrove trees in Kariagau village, as well as 6,000 mangrove trees and 2,000 mangrove seeds in Atas Air Margasari village. Who is responsible for the oil spill? Government and Pertamina officials have stated the oil company is not at fault for the oil spill incident, though an investigation into it is still underway. Officials seem to believe that a foreign coal vessel, MV Ever Judger, illegally passed through and dropped anchor in the bay, dragging away the pipeline. But, again, the investigation has not been concluded and no formal charges have been filed against anyone involved in the incident. Coordinating Maritime Affairs Minister Luhut Binsar Panjaitan has said that legal or administrative actions would be taken against those found guilty of causing the oil spill. How long will the cleanup process take? The Balikpapan administration and Pertamina have claimed the bay had largely been cleaned. But activists have cast doubt on their claim. To clean up the oil, the authorities in cooperation with Pertamina deployed oil spill containment booms, which are used to collect oil on water for recovery, as well as dispersants – chemicals sprayed on a surface oil spill to break down the oil into smaller droplets that more readily mix with the water. Six days after the incident, Balikpapan Environmental Agency head Suryanto claimed the cleaning process had reached 90 percent and the cleanup would end this week. Indonesian Institute of Sciences (LIPI) researcher Agus Haryono said the only oil that could be recovered was the oil on the surface of the sea, while the heavy oil that was already at the bottom of the sea could not be cleaned. This was echoed by Greenpeace activist Ahmad Ashov, who said the recovery rate for most oil spill cases was never more than 20 percent. That oil can not have been all scooped up this quickly. Would like more details.